Even in the midst of financial crisis for the university, the regents show they still know how to take care of their own. At the regents meeting in San Diego last week, regents handed out bonuses of up to $41,000 and raises of $20,000 to three UCOP executives. 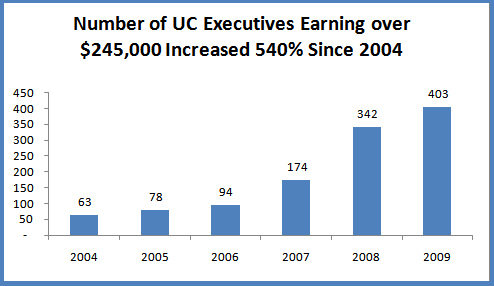 An analysis by UPTE based on public information shows that the number of executives making over $245,000 in base pay alone has increased 540% since 2004. UC unions are gearing up to meet with legislators next week to discuss their proposals for meeting cost-savings at UC. Several proposals deal with reducing management bloat and trimming perks. This followed predictions of permanent budget distress by the regents and a warning from President Yudof that UC will be forced to shut out eligible students for budgetary reasons. Radio station KPCC’s Patt Morrison hosted a discussion by two UC executives on this point. UPTE’s Health Care and Pension Bargaining Team had the first of a series of sessions with UC’s Office of the President in Oakland recently. The focus was to address the enormous 2011 premium increase for insurers, especially the Health Net HMO. The next bargaining session will be over pensions, and will take place at the UCOP offices on January 26 and 27th.